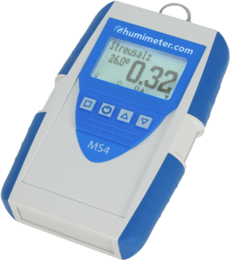 The portable humimeter MS4 salt moisture meter for various kinds of salt with fine and coarse structure. The small and handy salt moisture meter is highly mobile and can be used to measure the moisture of salt anywhere – fast, easy and reliable. Its characteristics make it especially well suited for measuring the moisture of road salt and other types of salt used for industrial purposes.